Everett was one of the great American orators of the antebellum and Civil War eras. He is often remembered today as the featured orator at the dedication ceremony of the Gettysburg National Cemetery in 1863, where he spoke for over two hours—immediately before President Abraham Lincoln delivered his famous two-minute Gettysburg Address. After being defeated in the 1839 election by one vote, Everett was appointed Minister to Great Britain, serving until 1845. He next became President of Harvard, a job he quickly came to dislike. In 1849, he became an assistant to longtime friend and colleague Daniel Webster, who had been appointed Secretary of State. Upon Webster's death Everett served as Secretary of State for a few months until he was sworn in as U.S. Senator from Massachusetts. In the later years of his life, Everett traveled and gave speeches all over the country. He supported efforts to maintain the Union before the Civil War, running for Vice President on the Constitutional Union Party ticket in 1860. He was active in supporting the Union effort during the war and supported Lincoln in the 1864 election. The workload also took its toll on young Everett, who around this time acquired the nickname "Ever-at-it", which would be used throughout his life. For a change of pace, Everett traveled to Washington, D.C., where he visited with Daniel Webster and other Federalist Party luminaries from Massachusetts. In late 1814 Everett was offered a newly endowed position as professor of Greek literature at Harvard. The position came with authorization to travel for two years in Europe, and Everett readily accepted. He was formally invested as a professor in April 1815. Everett was also elected a member of the American Antiquarian Society in 1815. Everett made his way across western Europe, visiting London and the major Dutch cities en route to the German city of Göttingen. There he entered the university, where he studied French, German, and Italian, along with Roman law, archaeology, and Greek art. He was a disciplined student, but he and George Ticknor, with whom he had traveled, were also quite sociable. Everett noted that they were viewed by many at the university as curiosities, and were often the focus of attention. He was granted a Ph. D in September 1817, which he believed to be the first such degree awarded to an American. In 1820 Everett was elected a Fellow of the American Academy of Arts and Sciences. That year he became editor of the North American Review, a literary magazine to which he had contributed articles while studying in Europe. In addition to editing he made numerous contributions to the magazine, which flourished during his tenure and reached a nationwide audience. He was also instrumental in expanding Harvard's collections of German language works, including grammars, lexicons, and a twenty-volume edition of the collected works of Johann Wolfgang von Goethe, whom Everett had visited in Weimar and whose works he championed on the pages of the Review. Everett began his public speaking career while he taught at Harvard, which combined with his editorship of the Review to bring him some national prominence. He preached at a service held in the United States Capitol that brought him wide notice and acclaim in political circles. In 1822, he delivered a series of lectures in Boston on art and antiquities. The series was well attended, and he repeated it in subsequent years. He made a major speech in December 1823 advocating for American support of the Greeks in their struggle for independence from the Ottoman Empire. This subject was adopted by Daniel Webster, who also made it the subject of a speech in Congress. (Everett's support for Greek independence made him something of a hero in Greece, and his portrait hangs in the National Gallery in Athens.) This collaboration between Webster and Everett was the start of a lifelong political association between the two men. On May 8, 1822, Everett married Charlotte Gray Brooks (November 4, 1800 - July 2, 1859), the daughter of Peter Chardon Brooks and Ann Gorham, who like Everett were of old New England lineage. Brooks had made a fortune in a variety of business endeavors, including marine insurance, and would financially support Everett when he embarked on his career in politics. Everett would also become associated through the Brooks family with John Quincy Adams' son Charles Francis, who married one of Charlotte's sisters. Abolitionism and temperance were two issues that became more politically prominent during Everett's tenure, and both of those matters, as well as Whig indifference, would play a role in his defeat in the 1839 election. The abolitionist Liberty Party began to take shape in 1838, and the ill-timed passage of a temperance law banning the sale of less than 15 US gallons (57 l) of alcohol would drive popular support away from the Whigs in 1839. The election, held November 11, 1839, was so close that the results were scrutinized by the (Whig-dominated) legislature when it met in January 1840. A joint legislative committee reported that Morton received exactly one-half the votes cast, sufficient to secure his victory. (One vote less for Morton would have resulted in the Whig legislature deciding the election.) Everett refused to contest the results despite calls from the party to do so; he wrote, "I am willing to let the election go." Everett opposed the 1854 Kansas–Nebraska Act, which allowed the territories to choose whether to allow slavery by popular vote, calling it a "horrible" and "detested" bill. However, because of his health he missed a critical vote on the bill, departing the chamber during a debate that ended up lasting all night. This angered Massachusetts anti-slavery interests, who sent him a strongly-worded petition to submit to the Senate. Because of his distaste for the more extreme elements in the abolition debate, Everett's speech in support of the petition was weak, for which he was further criticized. The rancor of the situation greatly upset Everett, and he submitted his resignation letter on May 12, 1854, after only a little more than one year into his six-year term, once again citing poor health. Everett was disheartened by the sectional divisions between the northern and southern states during the late 1850s. The 1860 election threatened to produce a national crisis, with pro-slavery Southerners splitting the Democratic Party and threatening secession if a Republican were to be elected President. A group of conservative ex-Whigs organized the Constitutional Union Party, which claimed as its sole principle the preservation of the Union. Supporters of Everett put his name forward as a candidate for president, but the party ended up nominating John Bell, and Everett for Vice President. Everett reluctantly accepted the post, but did not campaign very much. 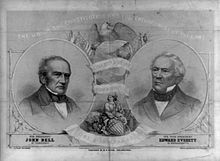 The Bell-Everett ticket received only 39 electoral votes, all from Southern states. In November 1863, when the military cemetery at Gettysburg, Pennsylvania was dedicated, Everett, by then widely renowned as the finest orator in the country, was invited to be the featured speaker. In his two-hour formal oration he compared the Battle of Gettysburg to battles of antiquity such as Marathon, and spoke about how opposing sides in previous civil wars (such as the War of the Roses and the Thirty Years' War) were able to reconcile their differences afterward. Everett's oration was followed by the now far more famous Gettysburg Address of President Lincoln. For his part, Everett was deeply impressed by the concise speech and wrote to Lincoln noting "I should be glad if I could flatter myself that I came as near to the central idea of the occasion, in two hours, as you did in two minutes." In the 1864 election, Everett supported Lincoln, serving as a presidential elector from Massachusetts for the Republicans. On January 9, 1865, Everett spoke at a public meeting in Boston to raise funds for the southern poor in Savannah. At that meeting he caught cold, which he exacerbated four days later by testifying for three hours in a civil dispute concerning property he owned in Winchester, Massachusetts. Everett wrote a letter to the publishers N. A. & R. A. the morning of his death, in which he said: "I have been very ill." He died in Boston on January 15, and was interred at Mount Auburn Cemetery in Cambridge. In the 1992 alternate history novel The Guns of the South by Harry Turtledove, Edward Everett runs as the running mate to George McClellan's Independent campaign in the 1864 presidential election. The ticket comes in last in the popular votes but third in the electoral votes. They win 7.1% of the popular vote with 287,749 votes and get 10 electoral votes from the states of Delaware and New Jersey. ^ "The thirteenth catalogue & a history of the hasty pudding club". HathiTrust. Retrieved 2017-01-27. ^ "Book of Members, 1780–2010: Chapter E" (PDF). American Academy of Arts and Sciences. Retrieved September 15, 2016. ^ Call Bush, Philippa; Everett, Anne Gorham. Memoir of Anne Gorham Everett: with extracts from her correspondence and journal. ^ United States Congress. "William Everett (id: E000269)". Biographical Directory of the United States Congress. ^ Frothingham, pp. 451–452. Everett was following in a long line of dedication speakers at "rural cemeteries" in northern states, which ran back to 1831 when Justice Joseph Story delivered the dedication address at Mount Auburn Cemetery in Cambridge, Massachusetts. Alfred Brophy, "The Road to the Gettysburg Address," Florida State University Law Review 43 (2016):831–905. ^ "Proceedings of the Massachusetts Historical Society". books.google. ^ "Everett, PA". Bedford, PA County Business Directory. Archived from the original on 2013-06-28. Retrieved 2013-05-08. Hayward, John. A Gazetteer of the United States of America. Hartford, CT: Case, Tiffany and Co. OCLC 225587. Mason, Matthew (2016). Apostle of Union: A Political Biography of Edward Everett. University of North Carolina Press. Wikimedia Commons has media related to Edward Everett. United States Congress. "Edward Everett (id: E000264)". Biographical Directory of the United States Congress.